The OSS® ASN.1 Tools for C++ is a development tool for building true C++ applications using ASN.1. This product provides the application programmer with a series of C++ classes that allow common programming operations according to the well-known principles of object-oriented programming. This popular product features a powerful compiler, a runtime library with ASN.1 BER, CER, DER, PER/UPER, CPER/CUPER, OER, COER, XER, CXER, E-﻿XER, and JSON encoder/decoder engines, and a number of utilities to simplify and speed your development. Our ASN.1 products support LTE Advanced Pro including NB-IoT, C-V2X and LTE-M. OSS products will support the 3GPP 5G specifications, which will be released in 2018. The compiler takes ASN.1 specifications as input, and generates C++ classes as well as control tables for encoding/decoding. In addition to core functionalities, the OSS compiler offers diagnostic capabilities that minimize your development time and effort. The OSS toolkit includes a set of runtime libraries designed to implement ASN.1 encoding and decoding functions and perform auxiliary operations on application messages. Support for JSON Encoding Rules allows serializing ASN.1 data to the popular JSON format and converting between JSON messages and ASN.1 binary messages. Support for OER allows working with ASN.1 binary messages that can be encoded/decoded significantly faster than BER and PER messages, while being only slightly less compact than PER messages. Support for E-XER allows generation of XML compatible with output from XML Schema tools. More information about how to create, compile and link your ASN.1 application using the ASN.1/C++ Tools. 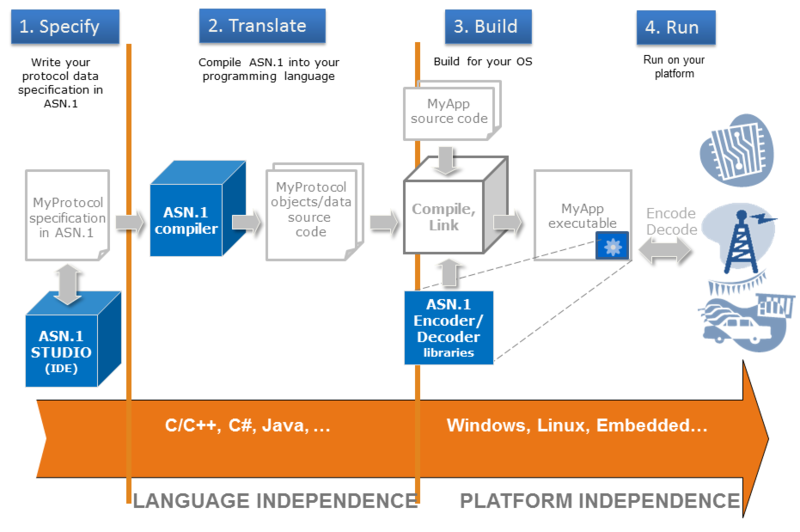 Download the ASN.1/C++ Tools today! We are here: 24 hours a day, 7 days a week. Quickly receive answers to your support questions.